Freezing Buttermilk - Why waste part of the container? Freezing Buttermilk – Why waste part of the Container? If you are like me, you will find that most recipes call for much less than a carton of buttermilk and the rest of it can go to waste before you use it again in another recipe. Don’t waste the rest of the container. Freezing Buttermilk is the answer. You can just pour the remainder into a Rubbermaid container and freeze it. Be sure to measure it first and mark the container so that you will know how much the container needs. 1/2 or 1/4 cup measurements are handy. 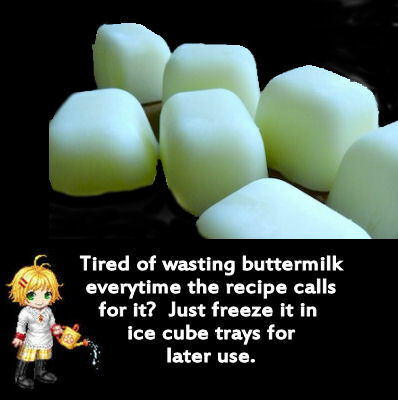 You can also just freeze the buttermilk in ice cube containers. Each cube is about 2 tablespoons, so two cubes would be 1/4 cup, or 4 cubes would be 1/2 cup. There are also extra large silicone ice cube trays that hold about 1/2 cup of liquid and this makes them perfect for this task. When it is time to use the buttermilk in future, just thaw and incorporate into any recipe! I have written a blog post on ways to use the large silicone ice cube trays…20 of them, in fact. You can see the post here. For more cooking tips, please visit my Facebook page The Gardening Cook.